Mission interface with Russia's mission tree. Missions are tasks formatted as a "tree", with each completed task allowing the completion of another task in addition to a reward. There are many generic missions available to all nations, with others being available depending upon nation, culture, religion, or region. Most of the nations have access to the generic missions. These missions are much like earlier repeating missions in which one would build up their military to their force limit, or work at improving their economy. 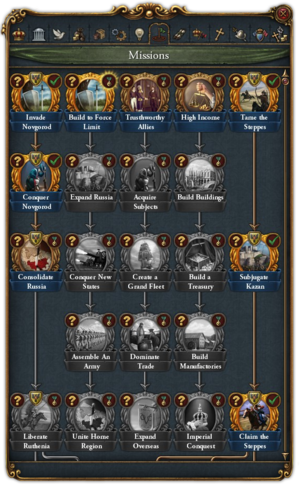 These missions are meant to give the player rewards for achieving standard goals of any Europa Universalis campaign, and may also be used by the AI nations to similar effect. Not all nations have unique missions. Most have only the generic missions or additional region or religion based missions. Nations with unique mission trees at 1444. ↑ 3.00 3.01 3.02 3.03 3.04 3.05 3.06 3.07 3.08 3.09 3.10 3.11 This mission tree still has unique content without the relevant DLC. ↑ This mission tree requires Purple Phoenix DLC.